R.S.W./D.I. Inc. is the exclusive United States Distributor for Aquascooter. We have continuously been in business selling Aquascooters, Parts and Service since 1979. We introduced the first generation Aquascooter in the seventies, this first model was the AS-400 and we have been involved in all its engineering improvements for the last 36 years covering models AS-400, AS-450, AS-500, AS-600 including the latest model AS-650. Nobody knows Aquascooter better than we do! The scuba diver surfaced a mile offshore in the icy North Sea waters. As his eyes swept the horizon, searching for his beacon of freedom - twin flashes from the Danish lightship, Gedser- a violent cramp doubled him over helplessly. He clung to the makeshift machine he had created, then turned in what he hoped was the right direction. As the cramp eased up, he let the machine carry him silently across the choppy sea. He looked up, navigating by the North Star. finally, shivering despite his wet suit and the heavy sweater he wore beneath it, he spotted the Gedser's two flashes winking in the far distance. When the lightship's crew dragged him and his water-machine aboard, he had been afloat for nearly five hours. Bernd Boettger's prototype Aquascooter had completed its first successful test run. Boettger, a chemical technician, had escaped form East Germany. his first attempt was unsuccessful. While visiting the beach at Mecklenburg he noticed the Gedser 15 miles off nearby Gral-Mueritz. the lightship rides permanent anchor in the North Sea. An excellent swimmer and former lifeguard, he decided to swim to it. He soon leaned that escaping under his own power was impossible. The sea was too rough, the water too cold and the distance too great. He decided to make a machine that would pull him through the sea. For eight months Boettger worked, building his prototype but on his first attempt to test the machine, he was spotted by marine border guards at Batterhagen, arrested and jailed for three months. Although he was convicted of an illegal attempt at border crossing, his employment in an essential industry resulted in a suspended sentence - and he was allowed to remain by the seaside. Boettger, armed with a fierce set of requirements, began work on a second machine: the vehicle had to be quiet; it had to pull him under water; it had to hold enough fuel for the 15-mile journey; it had to work the first time. The machine took a year to build. After purchasing its 1 1/2-HP scooter motor, he built his water-scooter from scratch. The 22-pound mini-sub consisted of a fiberglass tank, an engine, a propeller and a snorkel-equipped breathing unit. The tank had two compartments. One held approximately seven quarts of fuel, the other the flotation unit and air for the engine, a muffler for the exhaust and the breathing unit. When the machine was ready, with a full tank he could count on five hours of movement at approximately three miles per hour. Boettger entered the sea at 11:30 p.m. on a starry night in September 1968 from the beach at Bad Warnemuende, not far from Gral-Mueritz. He immediately sank to the 1 1/2-foot depth that would allow him to pass marine border guards manning the coastal watchtower only 1,000 feet form his entry point. For an hour he let his machine drag him under the sea. When he saw no sign of pursuit, he cautiously broke the surface, dropped the 12 1/2 pound leaded belt he had used for ballast and skimmed across the surface. Boettger also carried a second belt for provisions. It contained Vitamin C and a plastic bottle holding a mixture of sugar, chocolate and milk. A small rubber balloon held 10 ounces of drinking water. On his back, he carried safety equipment: a rolled-up air mattress and tools for repairs at sea. For the first hour he remained submerged, occasionally lifting his head out of the water looking for pursuit - but his departure went unnoticed and the snorkel was too small to be spotted with searchlights. During the voyage, he held onto the bottom part of the pipe beneath the scooter, the propeller screw rotating just in front of his nose. He swam in total darkness for two hours before spotting the Gedser's signal. It took him nearly three more hours before he was spotted by the ship's watch. 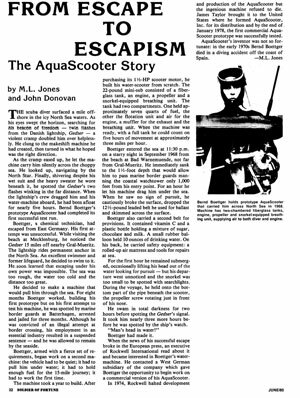 When the news of his successful escape broke in the European pres, an executive of Rockwell International read about it and became interest in Boettger's water machine. He contacted a Wet German subsidiary of the company which gave Boettger the opportunity to begin work on a commercial version of his AquaScooter. In 1974, Rockwell halted development and production of the Aquascooter but the ingenious machine refuses to die. James Taylor brought it to the United States where he formed AquaScooter Inc. for its distribution and by the end of January 1978, the first commercial Aquascooter prototype was successfully tested. 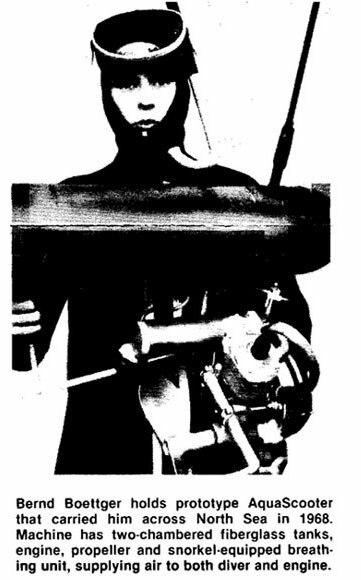 Aquascooter's inventor was not so fortunate: in the early 1970s Bernd Boettger died in a diving accident off the coast of Spain.